In discussing the Beatles' Sgt. Pepper's Lonely Hearts Club Band, I inevitably find myself coming back to the execrable 1978 movie based on that album. You know the story: Pop impresario Robert Stigwood, the manager of the Bee Gees, owned the movie rights to 28 Beatles songs - all but five of them from the Sgt. Pepper and Abbey Road albums - tried to weave them into a coherent rock opera, and convinced both the Gibb brothers and Peter Frampton to play Sgt. Pepper's band, resulting in what became the Cleopatra of rock movie musicals. As bad as the movie was, the soundtrack album - including wrongheaded Beatles covers from Frampton and the Bee Gees but also wrongheaded Beatles covers from George Burns, Alice Cooper and Frankie Howerd (Frankie Howerd?) - was even worse. Indeed, it's generally regarded as one of the worst albums of all time. The Beatles themselves were not happy about any of this, and neither were their fans. When radio stations tried to play some of the selections from the movie soundtrack album, Beatles fans angrily called into these stations, demanding that they revert to playing the original Beatles recordings. The stations caved to the pressure; just as no one wanted to bother with the movie, no one wanted to bother with the soundtrack record. Well, what if I told you that someone put out an imitation Sgt. Pepper soundtrack record? That's right - someone ripped off a ripoff! Pictured above is an album of anonymous covers of the Beatles songs in the Sgt. Pepper movie, put out by Springboard Records. Springboard was a Los Angeles-based budget label that, in addition to putting out cut-rate compilations of various recording artists, put out LPs from anonymous studio bands that recorded copycat covers of pop hits and - you guessed it - movie soundtracks. Before the Sgt. Pepper movie came out, Springboard, guessing that it would be as big as hit as Robert Stigwood's two previous pop musical productions, Saturday Night Fever and Grease, tried to get in on the act by rush-recording and rush-releasing this fake soundtrack record performed by the soundalike group "Abbey Road '78." Abbey Road '78's job was not to copy the original Beatles recordings; their job was to copy the Beatles covers that the cast of the Sgt. Pepper movie recorded to lip-sync to in the film. That's right, Springboard thought it could swindle record buyers into buying a record that had imitators of Peter Frampton and the Bee Gees (and others) singing Beatles songs. But then, there was a lot of foolishness in the record business in 1978. Consider the Kiss solo albums. When the Sgt. Pepper movie tanked, this fake soundtrack record ended up creating more headaches for Stigwood's RSO record label (which issued the real soundtrack record) than for Springboard. See, when the legitimate soundtrack album bombed, the unsold copies were sent back to RSO . . . but so were copies of the fake Springboard release. About a million copies of the Springboard album, by some estimates, were sent to RSO along with copies of the actual RSO album. The joke went like this - the Sgt. Pepper movie soundtrack album was shipped double platinum and returned triple platinum. And it was all because record store employees, in sending back to RSO all of the records that said "Sgt. Pepper" and "movie" on the sleeve, couldn't tell the difference between the real movie soundtrack album and the ripoff. Ironically, that was a mistake that Springboard was counting on record buyers to make! And not all of the Springboard records went to either RSO or back to Springboard itself. Some of them remained in record stores, left in discount and cut-out bins, with eight-track versions cropping up in discount department stores and selling for fifty cents as late as the mid-1980s. On his blog "Classical Gas Emissions," Ben Century sums up the stupidity of this imitation soundtrack album quite succinctly. "The only thing worse than a bunch of famous artists doing bad Beatles covers," he wrote in 2008, "is . . . a bunch of nobodies doing bad impressions of famous artists doing bad Beatles covers." Capitol Records, the Beatles' American label, probably made out the best from all of this. When the Sgt. Pepper movie soundtrack came out, the label capitalized (no pun intended) on the fact that it had the original Beatles recordings available and promoted the Beatles' Sgt. Pepper album as if it were a new release. It even issued the title song and "With a Little Help From My Friends," backed by "A Day In the Life," as a new single, and there was even a Sgt. Pepper picture disc! I've confessed to having seen the Sgt. Pepper movie, and I also admit to having owned the RSO Sgt. 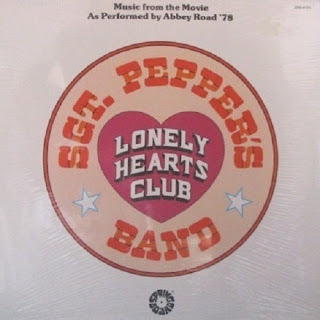 Pepper movie soundtrack album (I was twelve years old, for Pete's sake), but eventually, I happily graduated to the Sgt. Pepper and Abbey Road LPs that, er, inspired the movie. As we learned from the animated movie Yellow Submarine, the Beatles could pass for Sgt. Pepper's original band, because they were the originals. So why settle for a mere copy? And so, why settle for a copy of a copy? The Sgt. 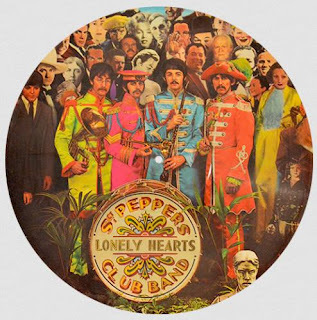 Pepper movie failed because Robert Stigwood, who died in 2016, essentially asked the biggest names in late-seventies pop to pretend to be the Beatles in a movie based on an album the Beatles made pretending to be other people. The big joke about the fake Springboard release was that Abbey Road '78 pretended to be other people pretending to be the Beatles. Oh yeah, here's Abbey Road '78 pretending to be Peter Frampton and the Bee Gees with their recording of "Getting Better." And it can't get any worse than this. Very amusing story. You know, my parents have the soundtrack and I used to not mind it, but when I got Abbey Road (because a lot of the songs on that album were covered in this movie) the soundtrack album didn't seem the same and then I read an interview with Barry Gibb where he said he wished he hadn't done this film and I have not listened to this record since. Mind you, The Bee Gees were lucky that it didn't do their career too much damage. Peter Frampton wasn't so lucky.